Is Appcues installed on the current page? Are page changes being tracked? What User Properties are being sent to Appcues? Why is/isn't a flow showing? The easiest test is to try Opening the Appcues Debugger. If you can't open the debugger you're likely not installed. 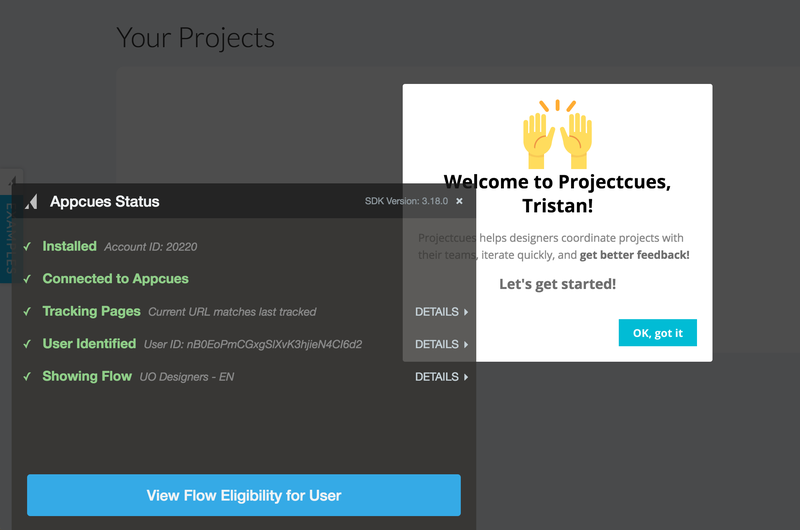 See the Installation Overview on how to install or send an email to support@appcues.com if you have already tried installing. As you navigate through your app, the debugger will watch for URL changes and show whether Appcues has checked each one. If the URL changes without Appcues being re-initialized, it will show the last URL that was checked. To check that things are working, navigate through your app or refresh your page. If the red X next to "Last Tracked URL" persists, Appcues is not tracking page changes. This could signal and issue with the Appcues.page() call. Select your platform type here to learn how you can install this call. ProTip: Publish a flow using "Show only to my team" targeting to the page you're on and see if the flow shows automatically. If you need to refresh the page in order for Appcues to appear, that indicates the Appcuest.page call is in the wrong place. You can see if the user has been identified during the current visit and how many properties were passed in the identify call. If the user properties are being sent correctly you will see a green ✔️. Clicking on "Details" will show all user properties that were sent at the moment for that user. A red X next to "User Identification" means that we cannot recognize a user on your page. If this is the case, you'll need to add either the Appcues.identify(), Appcues.anonymous() or both calls to your installation. Learn more about the Appcues.identify() call here. If you have Appcues installed via Segment, you'll want to make sure Segment's analytics.identify() call is being called on this page so Appcues can recognize your individual users. Learn more about Segment's identify call here. In the same section as "User Identified" (covered above), you can scroll through all user properties for the specific user (probably you) that is logged into that page at the moment. A full set of User Properties is available on the Events and Properties page in Settings. If a flow is showing, you will see the name of the flow along with and give you details about the group and step. If you see 'Content Omitted' that means there is a flow that should be showing but isn't for some reason. 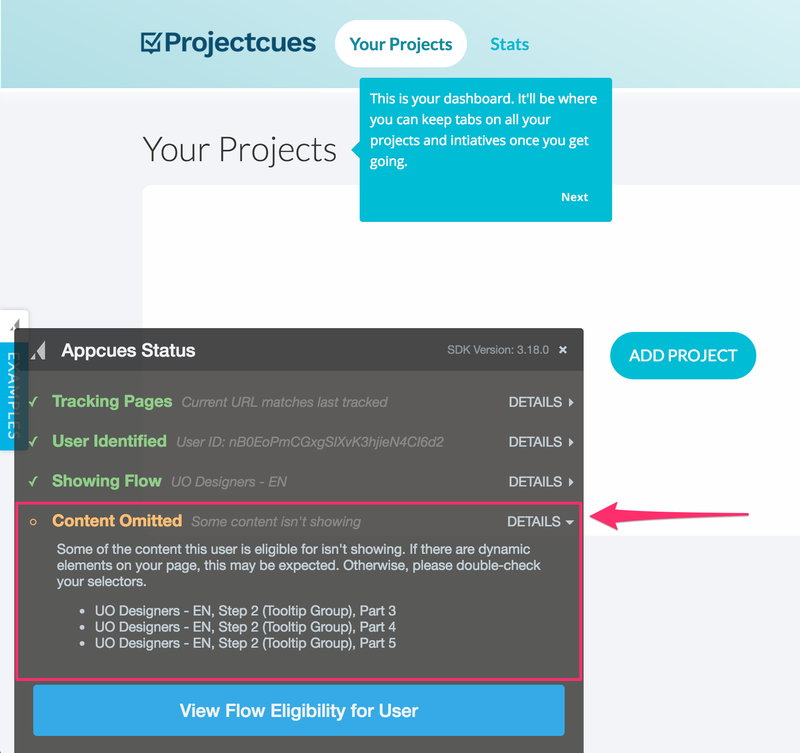 If you expect a flow to appear, but it does not appear in the Content Omitted group, select the 'View Flow Eligibility' icon to be taken to the Flow Diagnostics page for more information. If you notice that a step is omitted due to 'dynamic elements' or 'selectors', this can be an indication that the flow is waiting for something to appear on the page (this could be normal) before progressing, or that you should review the current step's selector to ensure that its unique and valid. Learn more about picking the right selector here. If you've confirmed the above but you still have questions, feel free to reach out to us at support@appcues.com and we'd be happy to assist!